In case you missed it, Sen. Joe Lieberman chaired a hearing last week looking into the role of passive, long-only index investors in pumping oil and other commodity prices. Details on the hearing are here: Financial Speculation in Commodity Markets: Are Institutional Investors and Hedge Funds Contributing to Food and Energy Price Inflation? I watched the video and learned volumes. Highly recommended for those who want to know how index speculators are inflating commodity prices. If you want the short version with the cites, read Michael Masters' testimony here(pdf). No one disputed Masters' analysis, including the Chief Economist of the CFTC, and the Chairman of the Commodity Markets Council. Masters' authoritative testimony also sparked a broad response in the media and financial blogosphere, and this article is a good start if you want to follow the action. But the billions that institutional investors have poured into these index funds managed by Wall Street banks could disappear. Mr. Lieberman is in the “early early” stages of creating a bill that would bar institutional investors in investing in commodities, a person close to the senator told DealBook. The bill would seek to amend the ERISA Act, making investments by institutional investors in the commodities market taxable. Pension funds like Calpers, the massive California public employees fund, have diverted increasingly more of their capital into the commodity space as other markets have done poorly amid the credit crunch. Calpers invested $450 million in commodities last year, its first foray into that space. In a board meeting in February, the pension fund agreed to invest .05 to 3 percent of its $240 billion fund in commodities by 2010. If institutional investors, like Calpers, are forced to divest its commodity positions, the market could go into a tailspin, crushing the positions of many of the banks that hold long positions. One of the investment banks’ more profitable businesses these days could be turned on its head. The bull run in commodities has been influenced by many factors, but Congress believes that Wall Street bears the blame for a large part of it. With gasoline prices on the rise and the election looming, they appear to have full power to not only close the oil casino, but burn it to the ground. It's very interesting how we've gone, in the space of a few short weeks, from "speculators have no effect" to "legislating against speculators is dangerous, it could crash the market". Commodity profiteer newsfeeds like Resource Investor are also getting very emotional about Lieberman's proposal -- a good sign that Joe is on the right track. My view: Let's go full-steam-ahead with this legislation. Run the experiment, and see what happens. What's there to lose? The futures markets functioned fine for decades without index investors. Let's clear out the riff-raff, and return the futures markets to the people they were built to serve: bona-fide producers and commercial hedgers. A persistent misconception in the peak oil community is the idea -- frequently repeated by Matt Simmons and other oil addicts -- that oil demand will continue to rise in the face of faltering supply. The underlying idea is that people "need" their cars to get to work and run errands, and thus there is no way for demand to fall. According to this theory, we really "need" oil production to grow in order to maintain mobility and keep society functioning. First let's do the comparison in terms of price. The average passenger car in the U.S. now gets about 22 miles per gallon, and gasoline costs roughly $4/gallon, so a car gets about 5.5 miles/dollar. The Segway, on the other hand, can run about 20 miles on one charge (1Kwh), and that 1Kwh costs roughly $.09 in the U.S. Therefore, the Segway gets about 222 miles/dollar. Conclusion: A Segway will get you from point A to point B about 40 times cheaper than the average car -- the equivalent of about 889 miles/gallon, at current gas prices. That right there is the fundamental debunk of all the peak oil hysteria. Why are we going to "need" all that oil to move people from A to B, when an efficient vehicle like the Segway will take you there at 1/50th of the cost, using 1/10th the energy, and that energy doesn't have to come from oil? In fact, it would be very feasible, even today, to generate all the charging energy for a Segway with home solar panels. 1Kwh per day is not a lot of energy. 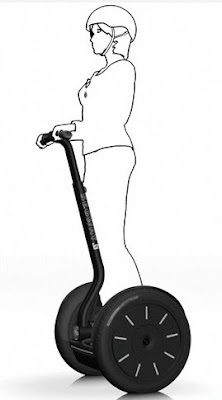 Of course, that's not to say that the Segway per se is "the answer". It isn't. Peak oil will be addressed by a wide range of vehicles, ranging from total vehicle elimination (as in telecommuting) to electric streetcar-style buses, to high end vehicles (like the Tesla roadster), and, in the long run, to people clustering into areas of greater density. The Segway, however, does demonstrate how little energy/oil we really need to maintain individual mobility and "easy motoring". $130 oil is really working wonders for peak oil websites like this one. I'm getting a nice surge of new visitors lately, so let's do a quick public service message on a little known fact that deserves broader airplay. An interesting phenomenon has happened in the last couple of days. The oil futures market has gone into a state known as "contango". I'm not going to go into any detail on the specifics -- if you're curious just do some googling. As a layman, all you really need to know is that, thanks to some complicated financial mumbo-jumbo, banks will now begin to hoard oil in storage tanks, driving up the price. And then they will sell that oil back to the public for obscene windfall profits. A LARGE warehouse in Amsterdam may seem an unusual place to attract the City’s top traders and hedge funds. But, in the past few months, Morgan Stanley has been accumulating warehouse space in the Netherlands to store its hottest new property — oil. Meanwhile, banks such as Morgan Stanley are also beginning to move into the physical market to buy oil — or even entire oilfields. Goldman Sachs recently bought 10m barrels of oil. With BP PLC accused of artificially inflating the price of propane by withholding some of its inventory from the market, government officials and energy traders are grappling with a question: When does smart trading cross the line into market manipulation? The shrewdest competitors in the energy-trading world these days deal heavily in physical shipments of fuel, not just contracts for the future delivery of such commodities. Owning actual oil, natural gas, propane and even electricity has two big advantages. It provides detailed knowledge of regional supply and demand and the pricing power that comes from holding large quantities of commodities. An explosion in the number of participants in the energy-trading world has led to an increase in so-called physical trading. Dominant commodity traders such as Morgan Stanley and Goldman Sachs Group Inc. long have had strategies to own or lease fuel-storage terminals, oil tankers and power plants to give them more flexibility to hold onto inventory or sell it at opportune moments. More recently, those Wall Street firms have taken physical trading to new levels with bids to buy, not lease, distribution facilities such as pipelines and production facilities including refineries. Hedge funds also have gotten into the game of dealing in physical energy and even metals assets. Storing oil became big business. 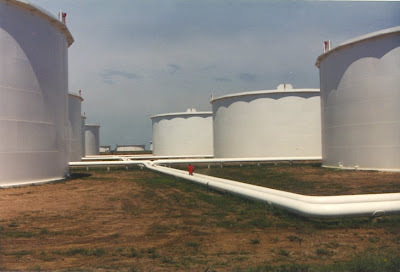 Tank owners and companies that leased storage, including Wall Street giants such as Morgan Stanley, turned sizeable profits simply by sitting on tanks of oil. They would buy oil for immediate delivery and stick it in their storage tanks, then sell contracts for future delivery at a higher price. When delivery dates neared, they closed out existing contracts and sold new ones for future delivery of the same oil. The oil never budged. The maneuver was known as the oil-storage trade. What's a white-shoe investment bank doing selling oil? The answer unfolds in Purchase, N.Y., where an army of its commodities traders sit before flickering screens on a vast, domed trading floor staffed 24 hours a day. At the former site of Texaco's headquarters, Morgan Stanley veterans Neal Shear and John Shapiro run one of the most profitable energy-trading operations in the world. But they don't just trade futures, a common way of betting electronically on commodities that involves buying and selling contracts for future delivery. Morgan Stanley also handles real barrels of oil and generates actual megawatts of power. The reason is twofold. Having access to barges and storage tanks and pipelines gives the bank additional options, to move or store commodities, that most energy traders don't pursue. And by having its finger on the pulse of the business, it hopes to get a more subtle feel for the market, a crucial asset to a trader. One member of [Morgan Stanley's] team, Olav Refvik, has amassed leases on storage terminals around the globe. In dealing with crude oil, the Morgan Stanley team at times buys the rights to oil companies' production in the Gulf of Mexico, then turns around and sells it while it is still underground. That was the beginning of a quiet strategy that later helped Morgan Stanley muscle into another huge petroleum market: home heating oil. The trader who largely carved out that dominance is Mr. Refvik. In the 1990s, he made a bold real-estate play along a grimy refinery row in coastal New Jersey near New York Harbor. The New York Mercantile Exchange, the country's main hub for trading oil futures, designates about two dozen sites there and in New York as places where exchange-traded oil can be delivered. Through leases, Mr. Refvik locked up a large chunk of the official storage space. He laid claim to tank farms -- clusters of giant metal storage drums. His team also leases a big storage terminal in New Haven, Conn. Lately there's been a lot of debate here and elsewhere about whether oil prices are being determined by fundamentals -- i.e. by supply and demand -- or by financial flows (i.e. dollar weakness, inflation hedging, speculation, hoarding). So let's take a look at the actual figures for world supply and demand from the IEA. These figures are taken from P. 51 of the IEA's 11 April 2008 Oil Market Report, available as a pdf here. For each time period below, the figure on the left is demand, and the figure on the right is supply, in millions of barrels per day. 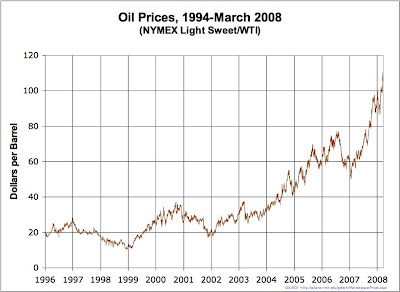 1) For the years 2004, 2005 and 2006, oil prices rose consistently despite the fact that there was no shortage, and supply was more than adequate to meet demand. The surplus of supply over demand was 0.9mbd in 2004, 0.7mbd in 2005 and 0.5mbd in 2006. The theory that oil prices rose in this period due to demand exceeding supply doesn't hold water. The figures clearly state otherwise. Supply substantially exceeded demand the whole time. 2) In 2007, there was a genuine shortage of oil. Demand exceeded supply by 0.4mbd, so a price rise was justified on fundamental grounds. In 1Q08 (Jan, Feb, Mar), WTI spot prices fluctuated up and down, but started and ended the period around $100/barrel. That would seem to accord with the fundamentals. Supply and demand were balanced during the quarter at 87.3mbd. I'll revisit this as the figures are updated, but, at the moment, the "demand is overshooting supply" theory looks pretty unlikely as an explanation of the feverish price behavior in April. On the whole, the peak oil community places way too much emphasis on industries that are dying and not enough on industries that are booming. This blog, on the other hand, has long emphasized the stimulative/creative aspect of peak oil -- i.e. that PO will cause explosive growth in the mitigating industries. The picture of peak oil is one of creative destruction or metamorphosis -- growth in another direction -- not downward collapse. Pacific, has tripled since 2001. 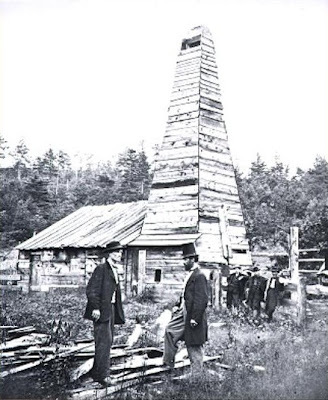 We are now at the highest real oil price ever attained in history, going clear back to 1861 and the days of Colonel Drake. So why is the economy still functioning? Peak oilers, mainstream economists, OPEC... They all believed that high oil prices would crush the economy, and pointed to numerous past cases where that actually happened. Well, here we are at the highest real oil price ever achieved in history, and the world economy is still vigorously growing. "BASEL (Thomson Financial) - Global growth is still strong owing to the resilience of emerging markets but inflation risks are significant, G10 central bankers group chairman Jean-Claude Trichet said, following a meeting of the group. 'At a global level, global growth remains significant despite the slowing down observed in a number of industrialised economies and clearly thanks to the remarkable resilience of a great number of emerging economies,' Trichet told journalists. It seems the economy is far more resilient to oil shock than expected. So what happened to the theory? High oil prices killed the economy every time so far. Why hasn't it happened this time? Even more curious: Now mainstream economist types like Yergin, Citibank and OPEC are predicting $150-200. $500 and $1000 predictions are being bandied about. So have we completely abandoned the theory that high oil prices cause economic recession/depression? Generally, I don't focus on day-to-day developments in new energy R&D. That role is admirably played by Jim Fraser's Energy Blog -- an excellent source for news on EVs, batteries, solar power and numerous other important topics relating to the ongoing energy transition. 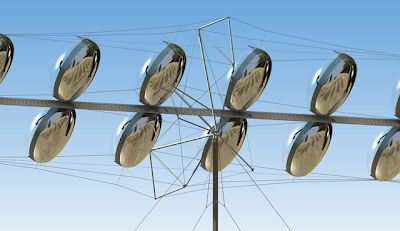 Today, however, I'd like to focus on a very interesting new approach to CSP (concentrating solar power) which Jim hasn't covered yet. As long time readers know, I am a big fan of low-tech think-outside-the-box concepts, and this new technique is a classic example. 25x cheaper installed than solar panels. 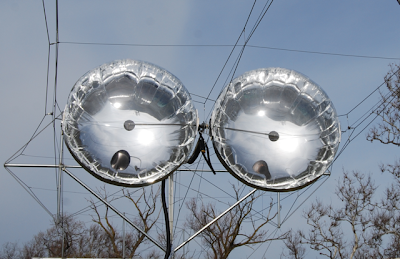 Inflatable mirrors are 400x cheaper than the polished aluminum mirrors used in conventional CSP plants. Rigging: Requires about 60x less steel than truss work, and minimal grounds preparation. Balloons can be installed on elevated rigging, for minimal impact on land use and habitat. More detail on the Cool Earth product can be found in this pdf and this video. The design philosophy was farsighted and clever. The aim was to minimize material use, weight and installation time, and thereby maximize scalability. How fast can you set-up solar power installations of this type? I'm thinking damn fast. You could probably pack a few thousand of those balloons into one semi truck. There's a truly huge difference between churning out square kilometers of polished aluminum, and churning out square kilometers of mylar.